We are a welcoming community of progressive Christians who build relationships by growing in and living out our faith and exploring our responsibility for social justice. Welcome to Body and Soul UChicago Campus Ministry! "The narrative is not just that we are serving campus ministry and the UChicago campus, but that also our reach goes beyond and impacts the congregations that we are to be in relationship with, which in turn is the call for us to go out because of the Holy Spirit and the Love that we receive at the Table. But not just for us to walk out the doors of the church, but for us to DO. 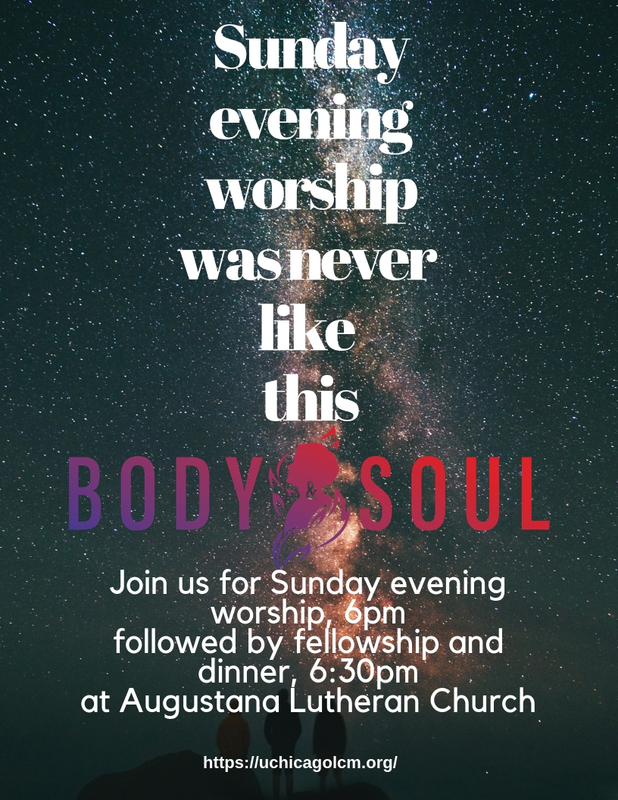 Body and Soul UChicago Campus Ministry is open and welcoming to everyone regardless of who you are or how you identify: whether cisgender or LGBTQIA. Being involved in Campus Ministry is more than just Worship, but as Bonhoeffer states clearly "As much as the Christian would like to remain distant from political struggle..the commandment of love urges the Christian to stand up for their neighbor." Understanding social location of where we are, and who is and isn't represented,Body and Soul UChicago Campus Ministry is called to live out our faith, not to hold it in, but to push forward and be that public example of the work that Christ has led us into. "The Spirit of the Lord is on me, because he has anointed me to proclaim good news to the poor. He has sent me to proclaim freedom for the prisoners and recovery of sight for the blind, to set the oppressed free" This is what we are called to do, as siblings in Christ and Faith, and to be the public Church. Stay in touch with Lutheran Campus Ministry by signing up for our weekly e-news!